We could write an entire series on the dos and don’ts of using your garbage disposal, but here are a few tips and tricks on how you can help prevent ruining your garbage disposal and how to know if there’s a problem. We tend to field more inquiries about broken garbage disposals around the holidays than any other time of the year. Many times, this is because we don’t always know what foods are “allowed” to be thrown down the garbage disposal. As a rule of thumb, if a baby can eat it, it’s safe for the garbage disposal. However, items such as eggshells, potato peels, bones, pasta, coffee, and anything greasy should stay clear. • Fruit scraps – especially citrus peels, are not only fine for your drain but can help keep your sink smelling fresh and clean. disposal. However, fibrous fruits and vegetables should be avoided. • Cooked meat – Cooked meat is typically fine to put down the garbage disposal. Be sure to cut it into small pieces so the disposal doesn’t have to work too hard to cut through it. After the machine is finished grinding your food, be sure to run the garbage disposal for a minimum of 20 seconds with cold water, allowing you to flush your food out of your sink and preventing any foul smells. If you notice any of these happening with your machine, call a trusted plumber immediately. 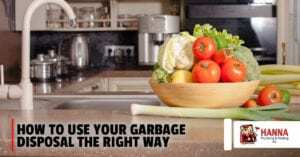 Need help with a garbage disposal repair or replacement? Call Hanna at (319) 377-2809.